German defender Cedric Makiadi has chosen to play international football for DR Congo despite living in Germany since he was eight years old. "After careful consideration I have decided to play for the country of my parents, DR Congo," said Makiadi. 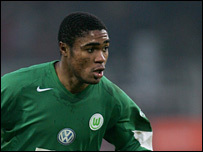 The 22-year-old, who plays for the Bundesliga side Wolfsburg, turned down an offer to play for the Leopards at the 2006 African Cup of Nations. Even though there have been reports of an imminent German call-up, the Kinshasa-born defender has now pledged his future to his country of birth. "I hope to help the country qualify for the 2008 nations Cup in Ghana as well as the 2010 World Cup in South Africa." Makiadi is now available for selection for next month's Group 10 Nations Cup qualifier at home to Ethiopia. A victory in the match in Kinshasa will boost their chances of winning the group that includes Namibia and Libya.